There is a mighty spiritual war raging all around us. You have sensed it, felt it, and hoped it wasnt quite so real. Its all happening; right here, right now, in YOUR life. David Skeba reveals why your life is the way it is and how you can change it for the better. We are born into a world where we find ourselves caught in the midst of Satans war against Gods kingdom. The battle is for our very soulsand for the glory of God! We have become the targets. We are the prize. Open your eyes and discover an invisible world you never knew existed. What you dont know can hurt you. Learn how to fight enemies you cannot see so you can victoriously finish your journey on earth, and then live with God forever. 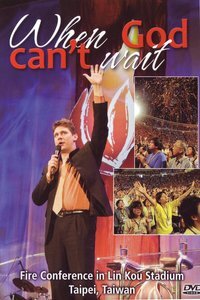 About "When God Can't Wait"
Daniel Kolenda has travelled to more than 60 countries, many in extremely dangerous and hostile environments, in order to share with people the truth about God and His extravagant love for them. He presently serves as president of Christ for all Nations, the ministry founded by acclaimed missionary evangelist Reinhard Bonnke. Daniel and Bonnke have travelled and ministered together seeing millions make decisions to follow Christ! Daniel's heart is not just to see people come to Christ but to make disciples! He longs to see people experience the fullness God intends for them and to know His voice and see miracles happen as part of their everyday experience. Daniel hosts an internationally syndicated television program broadcast to 118 nations, reaching 55 million homes in North America alone and over 120 million homes in Europe, Western Russia, the Middle East, North Africa, Australia, New Zealand and The Philippines. In addition to hosting some of the largest open-air meetings in the world, the CfaN team had distributed over 190 million books in 104 languages. Despite the incredible schedule he keeps, Daniel is still committed to his family. He's devoted to his lovely wife Rebekah and their three wonderful children: Elijah, Gloria and London.